The New Mexico state flag was designed by archaeologist Dr. Harry Mera in a flag design contest sponsored by the Daughters of the American Revolution in 1923 features Zia Indian's sun symbol in red on a yellow field. Buy 100% made in USA New Mexico flags from Tuff Flags and avail 6 months guarantee on constructions. All our commercial grade flags are made with utmost finesse and precision to ensure an eye catching display. 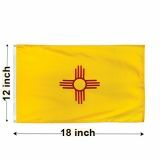 Offered in two materials choices of nylon and polyester and in all popular sizes, these flags are well suited for both indoor and outdoor displays. 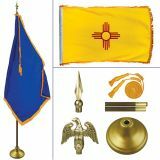 We also have a solid Oakwood indoor flag kit for those who wish to set up an instant flag display with least hassles. Shop from our complete line of New Mexico Flags right away and avail the best prices, quick shipping and much more! 100% customer satisfaction guaranteed! 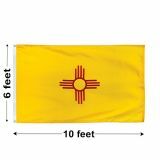 Celebrate your state pride and culture with our New Mexico flags, which will also make great gifts and collectibles. Made of superior quality materials and featuring colorfast Dupont ink, these flags will retain its beauty for a long time even if you wish to use it as daily use flags. Finished with heading and grommets and reinforced with lock stitching these single face reverse flags will make an elegant spectacle that will never fail to impress your audience. Browse our complete line of New Mexico State Flags to choose a model that will suit your needs. Not sure how to go about it? Feel free to call our toll free number (888) 287-3524 or email at customercare@tuffflags.com and we will assist you.